American dogwood flowering; photo by Universal Pops on Flickr (noncommercial use permitted with attribution / share alike). The dogwood is a small, deciduous tree with graceful branches that bloom in spring with large showy flowers (usually greenish-white, sometimes pink or yellow). The dogwood develops red berries in autumn, and the leaves also turn a deep red before falling for winter. 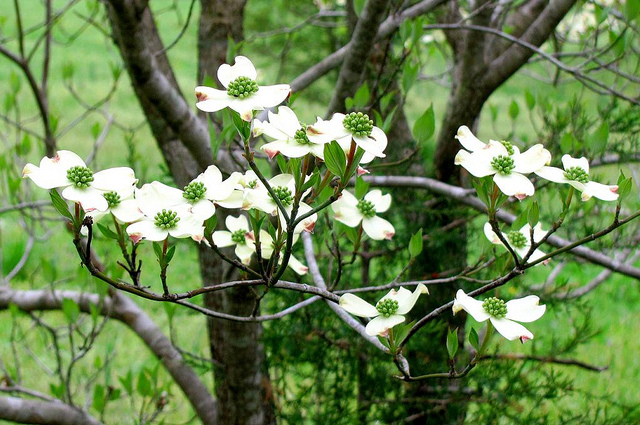 The word dogwood stems from "dagwood" (from the use of the very hard wood for making 'dags,' or daggers). The wood was also valued for making loom shuttles, arrows, tool handles, and other small items that required a very hard, strong wood. Larger items were also made of dogwood such as the screw in basket-style wine or fruit presses. An earlier name of the dogwood is the whipple-tree. The name "dog-tree" was being used by 1548, and finally dogwood by 1614. Once the name dogwood was used for the tree, it soon acquired a secondary name as the hound's tree, and the fruit became known as dogberries or houndberries. It is possible that the common name of dogwood developed because dogs were washed with a brew from its bark.